News Photo by Jonny Zawacki The Onaway volleyball team poses with the district championship trophy after sweeping Burt Lake Northern Michigan Christian Academy in the title match on Thursday at Onaway High School. Pictured left to right are: back: assistant coach Megan Estep, Breya Domke, Mattey Homer, Nicole Larson, Chloe Ehrke, Malaisya Van, Jackie Sellke and head coach Steve Watson; middle row: Taylor Larson, Mallorie Neelis, Jordan Larson, Malaurie McLean and Karli Tulgestke; front row: Calley Selke, Sunny Flory and Kennedy Crawford. 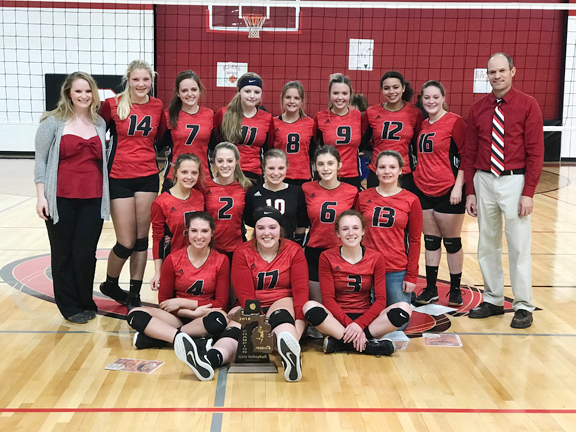 ONAWAY — Onaway’s quest for a district volleyball championship was capped off in dominating fashion on Thursday. 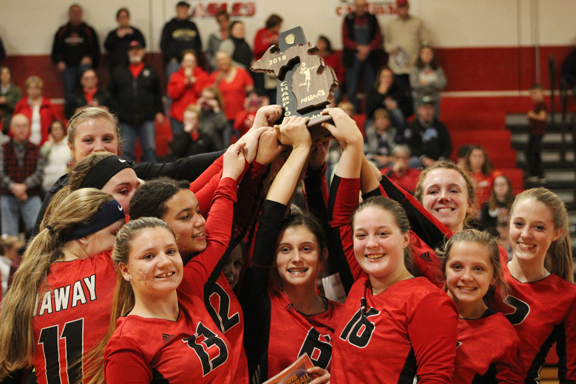 After sweeping its first two opponents in postseason play, the Cardinals left no doubt who the most dominant team in their district was as they once again earned a sweep, defeating Burt Lake Northern Michigan Christian Academy 25-9, 25-20 and 25-8 on their way to capturing a district championship for the first time since 2014. Thursday’s matchup wasn’t much different that Onaway’s previous two district games earlier this week. The Cardinals came out and dominated from the opening whistle and never let up. Onaway scored the first five points in the opening set and despite the Eagles battling and cutting an early lead to two, it didn’t take long for the Cardinals to go on a big run. News Photo by Jonny Zawacki Onaway senior Kennedy Crawford (3) hammers down a spike during the first set of a district championship volleyball match on Thursday at Onaway High School. Behind strong serving from Malaurie McLean, Onaway scored 10 unanswered points to take a 20-6 lead and closed out the first set with no problem to take an early lead in the match. The Cardinals saw another opportunity to empty their bench and played much of the second set with a new players on the court. New faces, but the result was the same as Onaway once again took the set despite not jumping out to a huge lead early on. 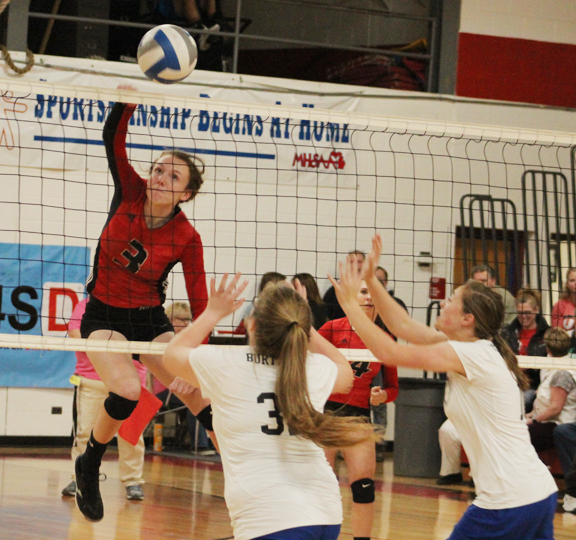 The Cardinals led 12-11 midway through the set, but later scored six straight points to take a 21-13 lead and put Burt Lake in a hole, eventually taking a commanding two set lead in the match. News Photo by Jonny Zawacki The Onaway volleyball team is awarded its district championship trophy after the Cardinals claimed their first district title since 2014 by sweeping Burt Lake Northern Michigan Christian Aacademy on Thursday at Onaway High School. The Cardinals put an exclamation point on a dominant performance in district play by finishing the way they began. Onaway again jumped out to a huge lead thanks to some strong serving from Mallorie Neelis as the Cardinals once again opened with five straight points and seven of the first eight. 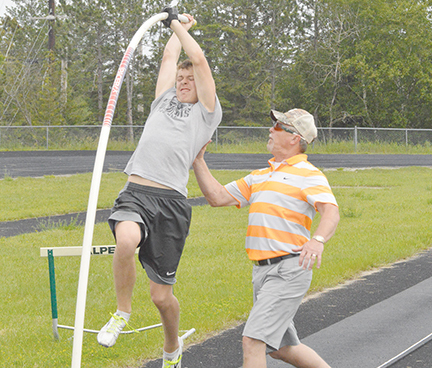 Onaway continued to build on its lead and finished its quest for a district crown by scoring 14 of the last 16 points to end the match in style and began the celebration. Neelis led Onaway dishing out 17 assists and adding eight digs, six aces and three kills. Breya Domke had four kills, three digs and a pair of aces. Calley Selke recorded six kills and two aces, Malaisha Van finished with six digs and three kills, Cloe Ehrke had four kills and four digs, Mattey Hoerner also had four digs and added three kills. Taylor Larson ended the night with eight digs, Crawford finished with four kills and Jackie Sellke chipped in with seven digs. 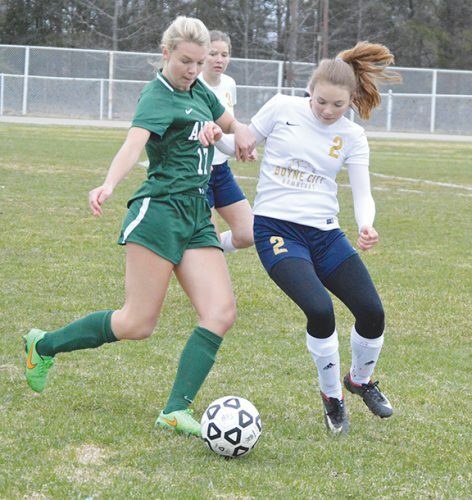 The Cardinals advance to Tuesday’s regional semifinal game against Pickford in Mackinaw City. This 2018 team is hoping it can create some of the same history the 2014 Cardinals did. 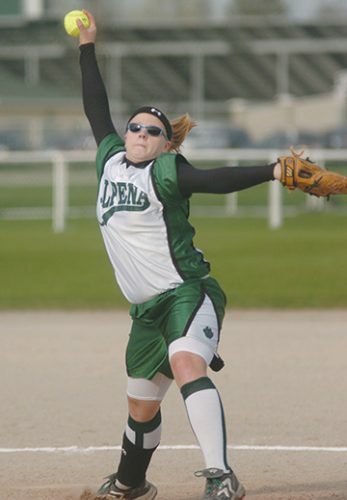 The last time Onaway won a district title, the Cardinals rolled to the semifinals in Battle Creek and were among the final four teams in Class D.